Just as sailboats are made for the wind, women are made for relationships-and with both it takes faith to overcome the fear to let go and trust God's direction. In this final book in the Faith, Hope and Love Trilogy, dramatist Nicole Johnson creates a visual reminder that God is in control. Instead of frantically paddling or -motoring- our way through the seas of our emotional connections with each other, she challenges us to freely let go and trust the -Windmaker, - God Himself, to help us find our way. Nicole Johnson is no stranger to the anxiety, worry and fear that life often brings. But like a loving parent, God does not leave His children to face the closet of our fears alone. He walks beside us as our strength and guide, uncovering our fears and laying them all to rest. Raising the Sail, a 2002 Women of Faith drama sketch, illustrates the power and promise of God and fully reveals that faith in God can bring us through the darkness into a new day. 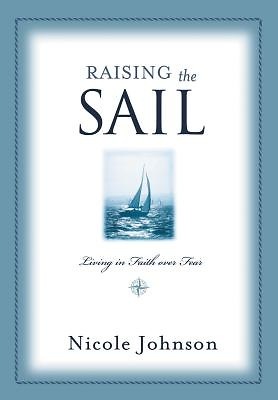 A powerful antidote in a world that depletes women of the God given-confidence and assuredness to release their fears, Raising the Sail offers the stirring reminder that all things work for the good of those that love the Lord.